Scenes like the one above on U.S. 127 South, can be found from one end of Clinton County to the other. With the arrival of spring and the summer tourism months not far behind, it’s time to show some pride in our home county and pick up some trash. 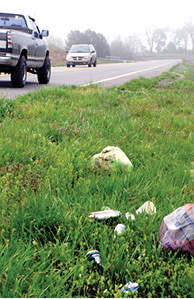 This trash was removed from the roadside after the Clinton County News photograph was made. The annual spring PRIDE Clean up continues through the entire month of April, and additional information about coordinated PRIDE events can be learned by contacting Clinton County’s PRIDE Coordinator, Andy Davis at 606-387-5917 or 606-688-4040.